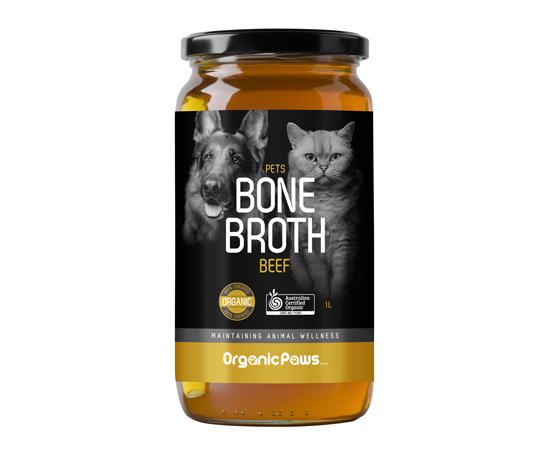 Our Beef Bone Broth is an 18 hour slow cooked thick gelatinous broth made with certified organic beef bones and non-fluoridated water, simple and perfect for maintaining excellent pet health. Broth is an excellent source of gut healing nourishment for both cats and dogs that both species absolutely LOVE !. Bone broth can be used as a delicious topper on all food and especially great for finicky eaters. It can also be replaced as a full meal instead of food for 24-48 hours for pets recovering from illness or transitioning to a raw food diet. Including bone broth as a regular addition to your pet’s diet is a natural yet revolutionary approach to maintaining optimum animal wellness. Freshly made and sold in 1 litre jars, please keep refrigerated and use within 7-10 days on opening. Organic Paws Recipes are complete and balanced meals suitable for cats and dogs of all ages.